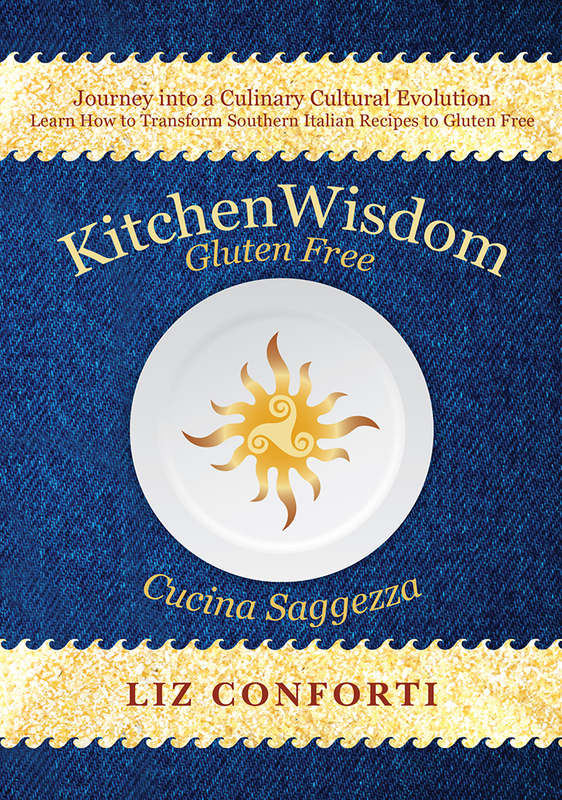 Kitchen Wisdom Gluten Free brings you these remarkably delicious butter nut cookies. Packed with protein and a bit decadent, variations of this cookie are familiar and popular in many European cultures, in the US we usually see them during the holidays. What I love about these cookies is their taste. They lend themselves beautifully to a cup of coffee. Preheat the oven to 275 degrees. Either butter a cookie sheet or line with parchment paper. Prepare and process the walnuts to a fine meal in a food processor. 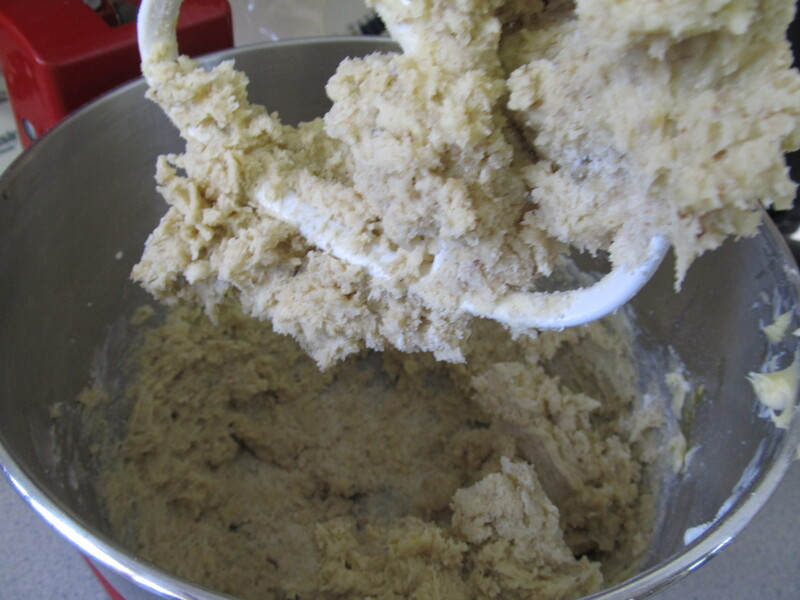 Place all dry ingredients (including the walnut meal) in a small, whisk to fully combine and place aside. 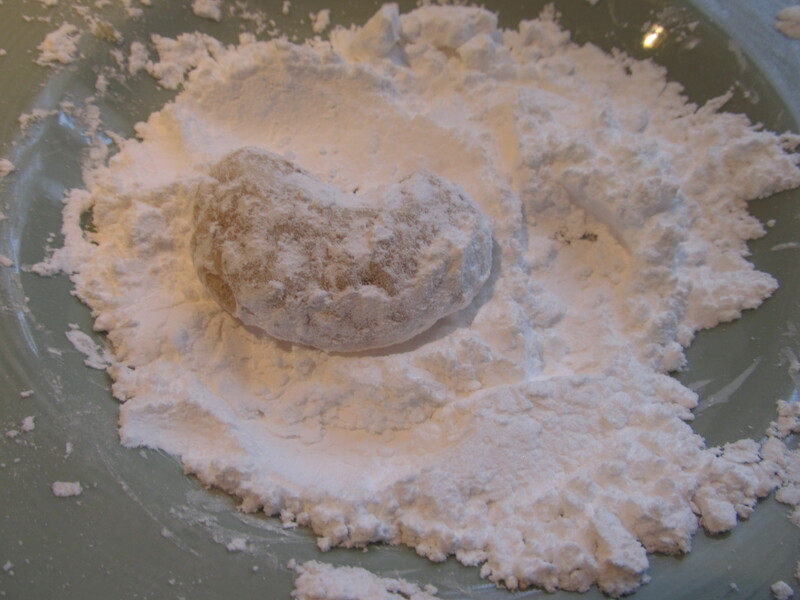 Cream butter, add 3/4 cup of powdered sugar and continue to cream with butter until light and fluffy. Make sure to scrape down sides with a spatula. Mix in vanilla. 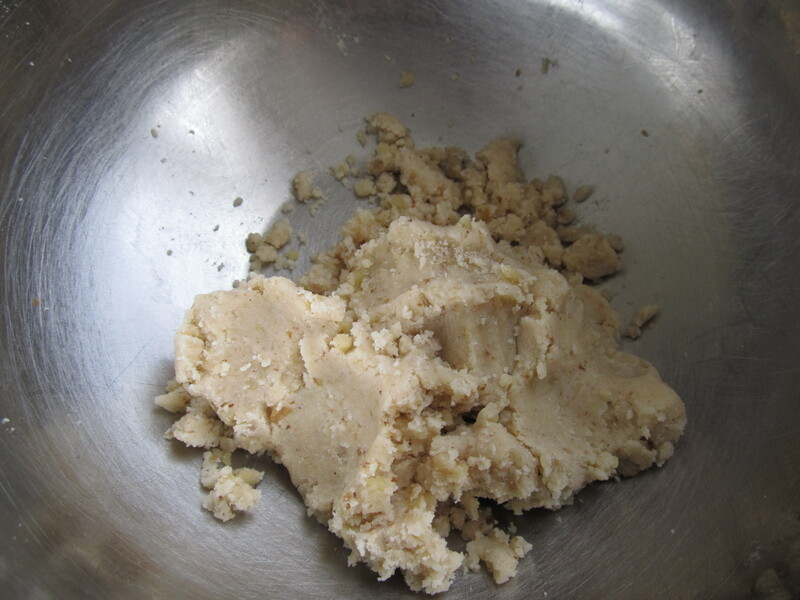 With your hands, pluck pieces of batter about 1 ½ inches and shape into small barrel by rolling the plucked batter in the center of your palms. Then wrap around a finger to create the crescent bend. 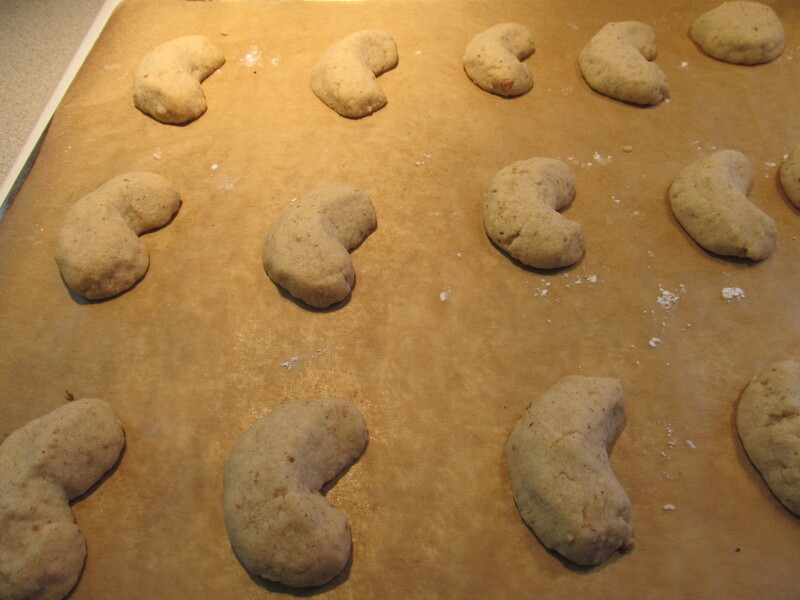 Place them about 2” apart from each other on cookie sheet. Leave on cookie sheet for 10 minutes once removed from oven. 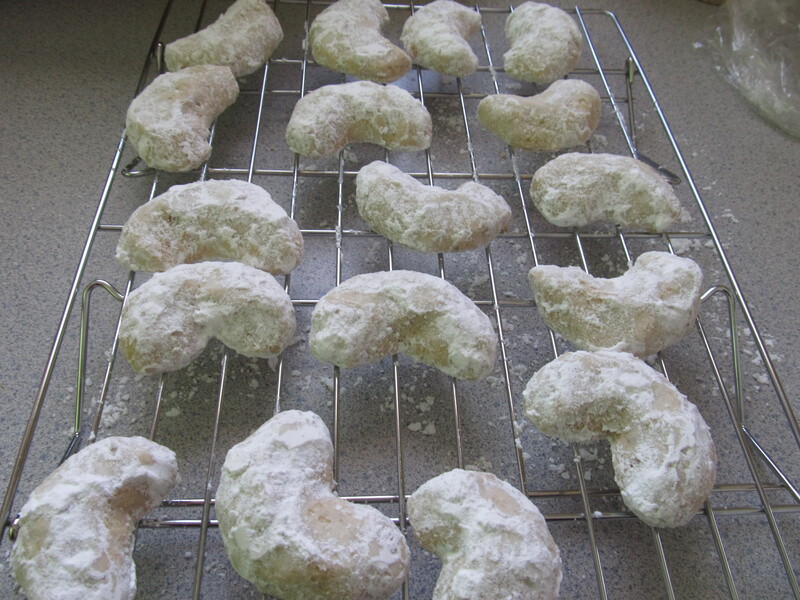 While the cookies are still warm, purge a cookie at a time in the confectioner’s sugar on the top and bottom. Place on cooling rack. This entry was posted on February 12, 2017 by kitchenwisdom2013 in arrowroot, baking gluten free, brown rice flour, celiac disease, celiac recipe, forget what you know about wheat, GF Ingredient, GF Recipe, gluten free baking, gluten free biscotti, gluten free cookie, gluten free crescent cookies, gluten free desert, Gluten Free Ingredient, gluten free italian recipe, gluten free vegetarian cookie recipe, gluten free vegetarian recipe, how to bake gluten free, how to use gluten free flours, italian, italian gluten free, italian gluten free cookie, kitchen wisdom gluten free, NCGS, non celiac gluten sensitivity, potato flour, potato starch, ricetta senza glutine, sorghum flour, walnut and tagged arrowroot, biscotti, brown rice flour, cookies, crescent, dessert, Guar Gum, mezzaluna, potato starch, walnut meal.